Highly detailed fantasy figurine portraying a delicate scene. 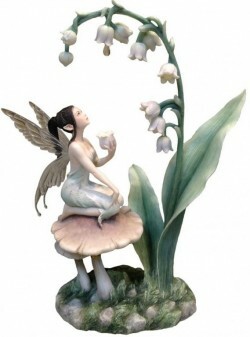 Fairy kneeling on a mushroom holding a flower as a cup to catch a droplet, whilst admiring the beautiful lily of the valley plant. Designed by Rachel Anderson, an American artist who has been specialising in Fairy and Fantasy art since 2004. Her work is inspired by the idea that there is an unseen world of magical creatures that are interconnected with nature and suffer if we harm it.